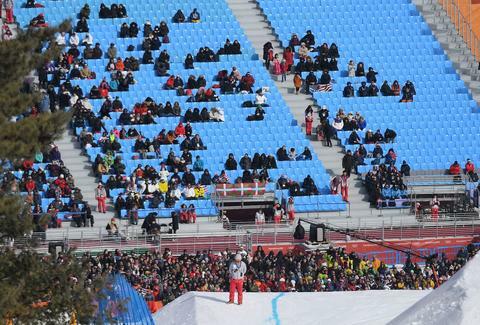 What’s Up With All the Empty Seats at the Olympics? If you've been watching the latest events in figure skating, curling, skeleton, skiing, and other spectacular moments that have unfolded at the 2018 Winter Olympics in PyeongChang, then there's a good chance you've noticed that crowds present at the Games have seemed pretty thin. Cameras regularly pan to reveal entire swaths of empty seats, and there don't appear to be that many slope-side spectators either, even during what many would consider the most exciting programs. And yet, organizers of the Games insist that tickets are nearly 90% sold out. So what gives? Where is everyone? The answer, it turns out, is quite complicated, and the seemingly low attendance can be chalked up to a whole host or reasons. Both the 2016 Summer Olympics in Rio and the 2014 Winter Olympics in Sochi seemed a bit under-attended, and empty seats similarly became a familiar site during big events. The International Olympic Committee (IOC) disputes that attendance is a problem. Still, it's not unusual for host cities to go to extreme lengths to fill empty Olympic event seats, from recruiting local "volunteers" like they did in Sochi to London's strategy to bring in the literal army. At PyeongChang, groups of South Korean students are being bused in to fill seats as part of a program by the Ministry of Education to familiarize them with winter sports, according to a report by The New York Times. Even though it's estimated that about one million tickets have been sold, PyeongChang organizers do reserve a large number of seats for athletes and their families. They also keep some open for the many deep-pocketed sponsors of the Games. A spokeswoman for PyeongChang 2018 blames the conspicuous empty seats mostly on athlete entourages and sponsor-affiliated spectators who fail to show up, per the NYT's report. Although getting to PyeongChang isn't terribly difficult, finding your way back to your hotel after a late-night event has proven challenging for many. Some foreign spectators have apparently resorted to asking strangers and even police officers for rides, since buses only frequent certain hubs around the area, according to the paper. Part of why you're not seeing packed events could have something to do with the fact that South Korea doesn't have a huge culture around alpine sports, as The New York Times suggests. It's possible there'd be higher turnout among locals if the Winter Games were hosted in places such as Norway, Germany, Sweden, or Austria. And while traveling to to see an Olympics in person is likely on many peoples' bucket lists, it's also prohibitively expensive for most when you consider that the average price of a week-long trip to PyeongChang this year is nearly $5,000. Whatever the reason, it's a shame people aren't packing in, because there are more than enough entertaining antics, charismatic athletes, medal-winning performances, and otherwise memorable moments to make it worth the ticket price.